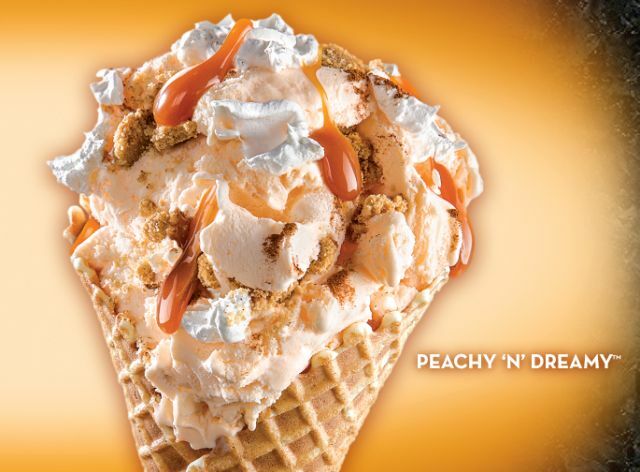 Cold Stone Creamery adds three new, seasonal flavors for this spring: peach ice cream, cherry almond cake yogurt, and strawberry lemonade sorbet. - Peachy 'N Dreamy - Peach ice cream with graham cracker pie crust, caramel, whipped topping, and cinnamon. - Cherry Cherry Quite Contrary - Cherry almond cake yogurt with chocolate chips, roasted almonds, yellow cake, and whipped topping. - Tart at Heart - Strawberry lemonade sorbet with a double helping of strawberries plus whipped topping. - Rich & Dreamy - Layers of devil's food cake and yellow cake, fudge, and sweet cream ice cream with chocolate shavings wrapped in chocolate frosting and cascading fudge ganache. - Strawberry Passion - Layers of red velvet cake, strawberry puree, and strawberry ice cream with graham cracker pie crust covered with strawberry frosting. The three new flavors are available through May 9, 2017, while the Mother's Day cakes are available April 14 to May 14, 2017.